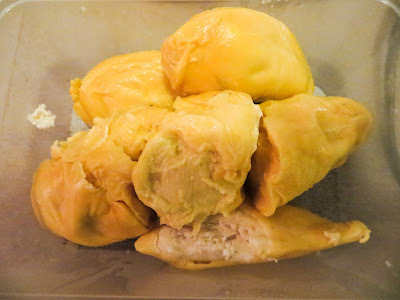 Durian… Smells like Hell, Tastes like Heaven… The King of Fruits. Regular visitors to Southeast Asia are able to recall countless interesting durian tales… and those tales all follow similar themes. I remember my first encounters with the legendary fruit in Indonesia of the 1970s. For a novice, the smell was bracing! I remember travelling through a Javanese town which had a fruit market at one end of the main street… and a durian market at the other end. Sensible. Years later, I remember the day on the Bali tour bus when everyone said they would like to try the fruit. Conquered by the smell, they all shirked their promise of sampling the Asian delight, and I had to eat the lot with the bus driver and the conductor. And I don’t like it! Pikers! Banned from hotels and buses and trains and planes, the King of Fruits has bad press in Western nations. It is the smell, isn’t it! The smell repulses the uninitiated… sometimes, even the initiated! During our Malaysian sojourn this year, we overheard one ‘friend’ tell another in quite serious manner, “Your car is older than ours. So, you take the durian!” The odour permeates clothing and fabric and upholstery. It lingers for days on end. 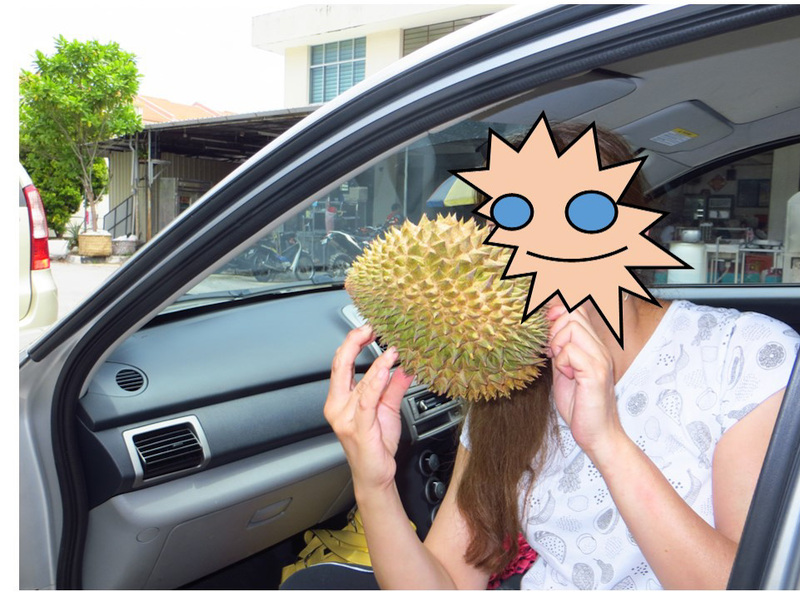 King or no King, you cannot allow the BMW to smell of durian! But, is it just the smell that gives the King its bad name? Or is it the fact that falling durians and falling durian trees regularly claim the lives of innocent victims? It is up there in mortality with Great White Sharks! As the years have passed, however, I am less repelled by, more tolerant of, the smell. Maybe, I am losing my sense of smell! Or, as she would claim, acquiring the aroma. In recent trips to Malaysia, I have had to be flexible. And inventive! How to keep the better-half, a durian fanatic, content? We would plonk a cardboard box in the boot of the hire car and fill it with durian kampung, village durian, whenever we would come across it. Then, feeling like criminals, we would smuggle one up the back stairs of the hotel, open it with a cleaver, consume it then smuggle the shell and seeds back down the stairs so that our room would not reek. This furtive behaviour lasted for two years until we were directed on arrival at KLIA not to put durian in the boot of the hire car. Our deception had been uncovered. The things we do for love! Then, we discovered the usefulness of plastic containers with layer upon layer of cling film. No smell anywhere, except on the breath! Just make sure you air out the fridge before you leave the establishment. 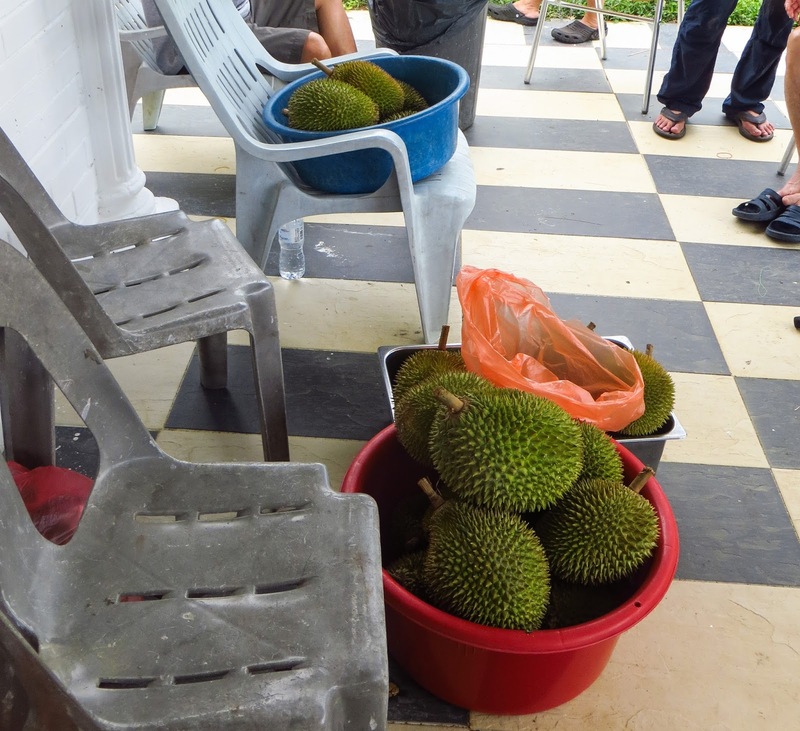 Anyway, our trip to Malaysia this year proved to be a durian-athon! It was July and there was an abundance of high quality durian in all the places we visited… Not cheap, but abundant, an absolute windfall of the prized fruit for my better-half. At Benum Hill Resort, we joined five other couples for a relaxing, gastronomical weekend… eleven Malaysian connoisseurs of durian and me, the outcast. They consumed basket upon basket of their favourite fruit. I had my Ipoh pomelo and some mangoes. In fact, being the only dinki-di Aussie, I did not want to attend empty-handed. So, I purchased two dozen beer for the men to consume over the weekend… Right? Wrong! I discovered that no-one who consumes durian will drink beer for fear of not surviving the experience. “Durian Plus Alcohol Can Actually Kill”. Scientists in Japan said they found that, “the lethal side effects might be due to stinky fruit’s high sulphur content which impairs alcohol breakdown”. So, if this is an urban myth or reality, who knows? What I do know is that my friends would not drink the beer! So, what makes a superior durian? Well, according to my expert partner, it is sweet. But then again, it has a little bitterness… It is moist but not wet… Its texture is smooth and creamy… It is soft, not hard… It has lots of flesh and smaller seeds. You know, even I, the outcast, could tell from the first taste, the first sucking of the flesh from the huge, smooth stone, whether the Benum Hill connoisseurs were feasting on a good durian. There was silence. Communal silence. And it was probably golden-fleshed Musang King which silenced them! Thence followed the profound discussions of its flavour, its texture and its other subtleties. So, how do you select a good durian? You have to look at the size and shape: irregularly shaped fruits might not hold enough delicious flesh. The skin colour has to be right. Has the fruit split? This is a sign that it is over-ripe. Check the spikes: close-packed spikes are a positive sign. Shake it gently: the resulting feel will inform you of its flesh versus seed content. The durian feast frenzy continued for two days, interspersed with wonderful main meals, good company and relaxing activities at the resort, including some fishing. And the beer? Well, it served a purpose for me, because durian breath and durian burp are definitely defeated by beer breath and beer burp! You need only ask the better-half. Just to set the record straight, I did not, could not, drink all 24 beers! Years ago, we visited the main tourist areas in Penang. However, we planned to visit the less popular hinterland of the island this year. One of our intentions was, of course, to pop into one or two of the more famous durian farms on the way to the township of Balik Pulau (literally, ‘Back of the Island’). After booking into our lovely hotel on Penang’s north coast, we went for an afternoon drive to the back of the island doing reconnaissance for the next day of touring. The drive was beautiful, passing through the township of Teluk Bahang, with its quaint pitcher plant monument, then turning south on to a snaking mountain road, passing through verdant forests of overhanging tropical trees. Little did we know that these statuesque, giants of trees were in fact durian trees… At least, not until, a misshapen weapon of mass destruction dropped from an overarching limb on to the road, right in front of our car. Startled by the occurrence, at first, I did not know what to do. Then, when the mind kicked in to gear, I realised that 60 Malaysian Ringgit (about $20 Australian) had just plummeted from the heavens. By the time that I had applied the brakes of the car, coming to a halt in the middle of the winding road, a cyclist riding up the mountain had beaten us to collect the prickly prize. Subsequently, I noticed the nets strung high above the road… And my thoughts recoiled to Great White Sharks! So, the next day, we headed back to our base in Ipoh. The following morning, we craved some Apam Balik, so we paid a visit to our new acquaintances at Canning Garden, Sandy and Aaron. As soon as we arrived, they wanted to know the news of our Balik Pulau excursion. Without even finishing our durian story, Aaron ‘dragged’ us to the little lottery office down the lane. Such incredibly good luck, he said, deserved the purchase of a Malaysian lottery ticket, a Toto. We selected our four-digit number, the four numbers of the car number-plate. Then, we waited overnight with baited breath to win the thousands of Malaysian ringgit on offer… Durian runtuh: we couldn’t lose! Luck comes in many forms. For us, it does not come in the form of magical millions of dollars. It comes in chance experiences. It comes in valued friendships. It comes in our amazing contacts with the natural world… These are our ‘Durian Runtuh’ moments. PS… I need to credit the better-half for the technical analysis of the extraordinary durian.